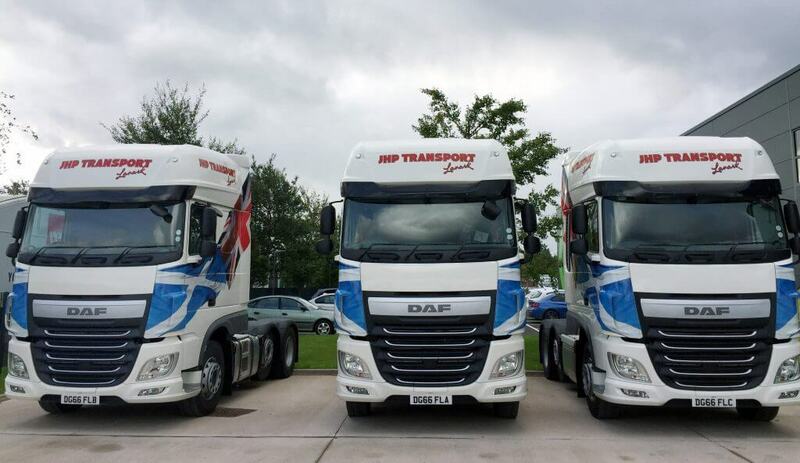 Lanark-based hauliers JHP Transport and Farm Field Fresh have expanded their joint fleet with five new DAF XF 460 tractor units, supplied by Asset Alliance on a three-year full-service contract hire deal. The five DAF trucks, which replace Mercedes-Benz Actros tractors previously provided by Asset Alliance, will primarily handle scheduled, long-distance temperature-controlled trunking work throughout the UK, seven days per week, 365 days per year. Jim Prentice, Managing Director at JHP Transport, says: “We have a great relationship with Asset Alliance – and as repeat customers, we’ve come to appreciate the company’s honest, open and straightforward approach to business. Specified with DAF’s Super Space Cab for driver comfort on long-haul trips, the five new arrivals join a mixed fleet of 37 DAF, Scania and Volvo trucks at the sister companies, which collectively handle 300 deliveries every week. Mr Prentice adds: “There are no hidden charges in an Asset Alliance contract – everything is above-board, and that gives us peace of mind that as the contract continues, we’ll enjoy a consistently high level of customer service. As part of the agreement, Asset Alliance, which is part of the Asset Alliance Group, and a specialist in commercial vehicle contract hire, finance, rental and leasing, will retain ownership of the five tractor units, taking on all the associated costs, including safety inspections, repair and maintenance requirements, servicing, tyre replacement and breakdown cover. At the end of the agreement, JHP Transport and Farm Field Fresh will return the vehicles to Asset Alliance, bypassing any of the stresses associated with used commercial vehicle disposal. Established in 2007 by James Hamilton Prentice, JHP Transport has grown from its roots as a one-truck owner-operator business into a fleet recognised around the country by its distinctive livery, emblazoned with both the Union and Saltire flags. Farm Field Fresh, which was incorporated in 2009, also operates from a depot in Sandilands, and specialises in the temperature-controlled transportation of foodstuffs and chilled goods. Asset Alliance Group is redefining the way companies acquire commercial vehicles, through its brands Asset Alliance , ATE Truck and Trailer Sales , Forest Asset Finance and Total Reefer .